Perfect for couples or a group of 3 friends. Comfortable apartment in beautifully kept tropical gardens just steps from the white coral sands, crystal blue waters and palm trees of Discovery Bay. The apartment is bright and airy with colourful fabrics, hardwood and cane furniture, and fans providing a cooling breeze. There is a very well equipped kitchen so you can rustle up anything from freshly caught tuna to a rum punch for sun downers. Enjoy watching humming birds feeding among the hibiscus and monkeys scampering up trees as you relax on the balcony. A wide range of bars and restaurants, an excellent supermarket and duty free shopping are all just a short walk away in Holetown. If you need to keep in touch there is free wireless broadband access for your laptop. Eating and Drinking: Zacchios Restaurant is a favourite 5 minutes stroll away with water side eating at sensible prices. Nearby Surfside Bar & Restaurant has a great Happy Hour, simple beach menu and TV screens for sports lovers. Holetown's First and Second Streets offer a mix including Mediterranean, Bajan, South Indian, Italian, Sushi and Asian restaurants. For upmarket dining Tides and The Mews deserve their reputations. Further afield The Fish Pot, North of Speightstown is worth the bus ride - as is Cariba to the South. To eat like the locals try the roadside vans - or the fish frys at Oistins and Half Moon Fort. Patisserie Flint can ease you into another laid back day with a latte and delicious banana bread. Beaches around the island: Discovery Bay and Settlers beaches are ideal for swimming with gently shelving sand, jet ski free areas marked by buoys & floating platforms for diving or sunbathing. If you want to chill in the shade with a good book they are fringed with Coconut Palms & Casuarina trees & Bougainvillea adding a splash of colour. Water skiing and other aqua sports are available on the beach - or you can book ahead at Discovery Bay hotel's kiosk. Mullins & Gibbs beaches are 4 miles north, Sandy Lane beach 2 miles south. Brighton beach just north of Bridgetown has a glorious expanse of sand + the delightfully laid back Weisers Bar.The South East Coast is a favourite place with all types of surfer. The East Coast is a complete contrast - almost deserted with big Atlantic rollers crashing in rather than the gentle Caribbean Sea. It is rugged and beautiful but beware of the dangerous undertow in many places. Crane Beach is superb - with a great deli en route called Cutters. Barbados and the Bajans offer so much: Barbados is a very beautiful island, with lots of art, activities, nightlife, music, history, great restaurants. But what makes Barbados special, and the reason so many visitors return year after year, is the Bajans who are warm, charming, always ready with a smile. They make you feel welcome and really at home on this lovely Caribbean Island. - - Do try a half day catamaran cruise up the West coast with lunch, drinks, wreck snorkeling and a swim with turtles. Barbados has a reputation for having the finest golf in the Caribbean, with championship at Sandy Lane & Royal Westmoreland 5 minutes away and Royal Barbados Golf Club further south. Also: Kensington Oval, best known of all West Indian Cricket Grounds. Rum distillery tour and rum shops - - Wildlife Reserve (north) - - Andromeda Botanical Gardens (east) - - Harrison's cave with impressive stalactites & and stalagmites (centre) - - the largest military garrison in the Caribbean. - - Enjoy. We live in Cambridge UK with Katy and Sammy who are 16 and 14. They love swimming with the turtles and the fresh fish at Ju Ju's Beach Restaurant. We bought Art Studio #7 in 2000 on our 3rd trip to Barbados. It is great to walk out the door and be on the beach in less than a minute. The Bajans are the friendliest people we have ever met, fantastic with children and wonderfully laid back. 40 yards/metres from the beach. Lovely tropical gardens Holetown on your doorstep. Everything you need! . Tiled bathroom with WC and walk-in shower - powered by efficient solar panels. There is also an outside shower at the side of the apartment for use after the beach. Communal Telephone for Art Stusio All calls in Barbados are free. The Housekeeper can do personal washing for a small payment to her. High speed fibre optic internet connection. You will be well looked after by our friendly staff. Meschelle is the Housekeeper who looks after our apartment. She is assisted by Helena (maid) and Elvis the gardener/handyman. They will ensure things run smoothly and answer any questions for you. We can arrange for you to be picked up at the airport by a local taxi firm. Eleven nights in January represented our first stay in Barbados for circa 20 years so the exceptional assistance and introduction to local services and restaurants provided by the owners even before we left meant we were well prepared to get the most out of our stay. The apartment is as described, the location is perfect being almost on the beach with easy access to quality bars, restaurants, and supermarket, being a five minute walk from Holetown offering fruit and fish by the roadside and a Ralph Lauren and Cartier collection in the Limegrove mall!. Housekeeping services are in attendance throughout the day.It may not be 5 star accommodation but it might just as well be as the studio apartment served as the perfect base to enjoy the beaches of the west coast and remarkable hospitality and character of the Bajan people. We enjoyed some very fine dining and some excellent fish on the beach. It seems Barbados meets one's needs at all levels. The owners do a fine job of providing information and advice on the experiences open to all so there's little point in replication. It's the Caribbean for goodness sake ! Just perfect - not one negative observation (aside from the tree frogs who could do with an early night). Thank you so much for your lovely feedback and the fact you "get" Barbados! We are glad you enjoyed your stay and look forward to welcoming you back another time. The apartment was exactly as the pictures showed, and the grounds were full of beautiful flowers, trees and shrubs. The best part was the location; a short walk to bars, restaurants, the bank and the grocery store. We went walking every day to pick up a few food items, and have happy hour at Surfside or Zaccios (our favourite on a Thursdsay). Meschelle kept the apartment very clean. I especially would like to mention how she came twice on her own time to help us with the safe; excellent service with a smile. Michael kept the grounds beautifully and helped with the umbrellas and chairs. We had the opportunity to meet Sarah the owner as she was in Barbados. Really enjoyed that she stopped by and we even saw her later at JuJu's. Highly recommend the apartment for a laid back, relaxed vacation. It is an older apartment complex, but well maintained and in the best location. We used the beach umbrellas quite a bit with some of the other residents. The wind was a bit hard on them, but Michael said he would have them ship shape when we return. We have booked out next trip to #7 and can't wait to go back. How beautiful our first time in Barbados , snd it was everything we could have expected. We had an awesome week in Hole town, the apartment was perfectly placed for the beach and the bars and restaurants at night. The apartment had everything we needed and a trip to the local supermarket provided all the provisions we needed to make what we wanted for lunch each day. We preferred eating at the restaurants on the beach in the evening and had a perfect walk back along the beach each evening. Having the Limegrove Cinema five minutes walk away was really great, we felt like we were locals by the end of the week. The studio is near a beautiful beach that offers great snorkeling. The Folkstone marine park is at walking distance too. The apartment itself is very nicely decorated, cleaned every day and has a very cosy terrace where we spent a great many hours talking and having dinner and drinks. Great local street food is available nearby if you want to avoid pricy restaurants. We had a wonderful stay here and can only recommend it. Will definetely be back. 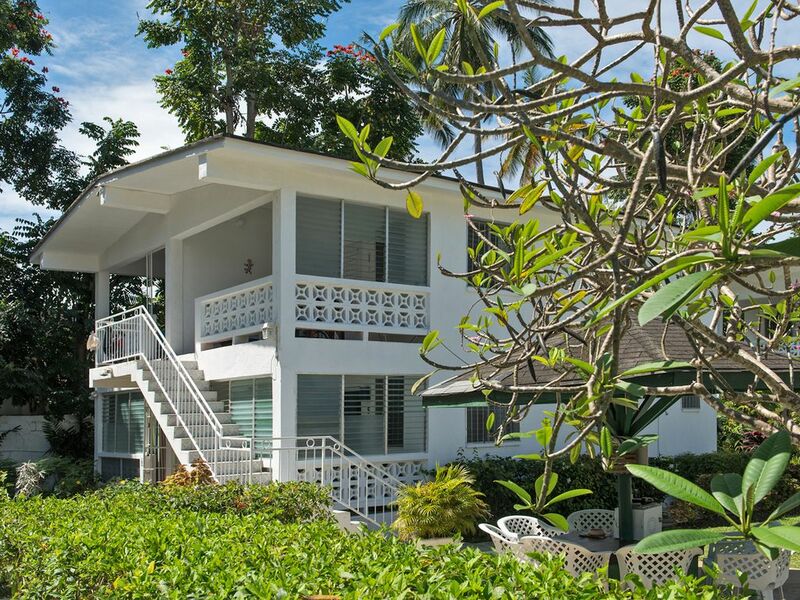 The apartment is 400 yards North of Holetown on the Platinum Coast - named after its beautiful white coral sand. Settlers Beach is 200 yards North and has Spago, a waterfront Italian restaurant. Folkestone Marine Park lies just beyond with excellent reef snorkeling, a museum, aquarium, picnic tables in the shade and tennis courts. Art Studio sits between the Sandpiper and Discovery Bay hotels which are happy for guests to use their pools and bars. Holetown has more than 20 restaurants, cafes and bars to suit every taste and budget (see 'Eating & Drinking' section below). It also offers banks, taxis, post office and a good range of shops. Catch one of Barbados' famous yellow buses from a stop 100 yards away to visit bustling Bridgetown or head north to laid back Speightstown. Other Activities: Liming, steel band, piano bar, reef snorkeling, swimming with turtles, glass bottom boat, jet ski, rum shops and distillery, marine parks. Rental rates include daily maid service, all utilities and linen - but please bring your own outdoor towels for beach and garden use. Flexible changeover day. You can rent by the night - just divide the weekly rate by 7. Additional adults are £100 per week, additional children £50pw. Late availability special rates - email us.